You’ll only be charged for members that are active on the day that you upgrade to a paid plan. A member is an active user if he/she has been on Slite at least once a month. If all members become inactive, you will be charged for a minimum of one member, unless you decide to downgrade to the Free plan. Any changes to the number of active members will be reflected in your monthly statement—whether you're billed monthly or yearly. If you’re on a paid plan and add new members partway through the billing cycle, changes will be reflected at the end of that month. Suppose your team is on the Standard plan paying monthly, which costs $8 per member per month. You add a new team member halfway through the month, the member is an active user. That means you'll pay for the new member at the end of the billing month. If you pay annually, it works the same way. We'll calculate the prorated cost for the rest of the year, and bill you at the end of the month for any new additions. Slite detects when members go inactive. You'll get credits to your Slite account and they'll be applied when new members are added or on your next renewal date. The credits are non-refundable and non-transferable: they'll expire if and when you choose to terminate paid services plans with Slack. Let's say your team is on the Standard plan paying monthly, which costs $8 per member per month. During the billing month, a member goes inactive. At the end of the month, the amount of prorated credits that will be deposited back to your team's account will be $8. Any credits that may accrue to Customer’s account (for example, from a promotion or application of the fair billing policy, will expire following expiration or termination of the applicable time purchased, will have no currency or exchange value, and will not be transferable or refundable. Credits accrued to a workspace on a free subscription plan will expire if the workspace’s plan is not upgraded to a paid plan within ninety (90) days of accrual, unless otherwise specified. 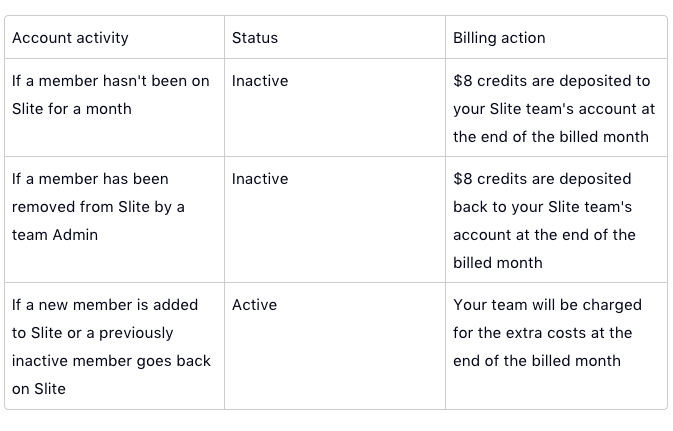 For more information on credits, please email us at support@slite.com .